Tides, Ralf Kleemann's second solo album containing music for New Celtic Harp follows the success of his first album Prydotia, with further development of his own music. The 12 tracks are new and of their own kind, displaying the full character of the Celtic harp. 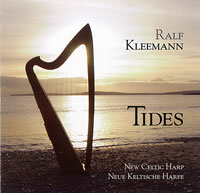 Tides is the second solo album with new Celtic harp music by Ralf Kleemann. All of the pieces are original compositions in which determined themes have the same importance as floating, spontaneous elements.